Big things are coming to the New York State Fairgrounds. 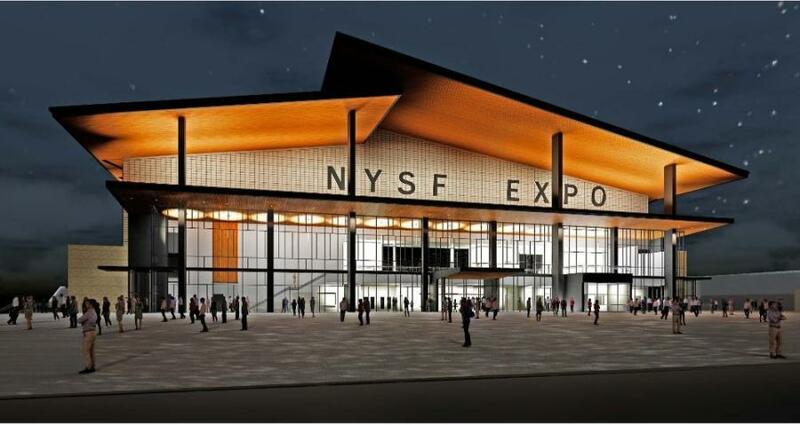 So big, in fact, that the new expo center being built on the grounds is being touted as “the largest event facility north of New York City and between Boston and Cleveland” by the NYS Fairgrounds website. The total contract, which was awarded to HBP Joint Venture, is valued at $62 million. The facility will feature 110,000-sq.-ft. of flexible program space along with 4,000 retractable seats. When being utilized as a trade show facility it will hold up to 500 (10 by 10 ft.) booth spaces. Remaining space in the facility will include event work space, meeting and conference rooms, a concession area, catering area and an outside balcony. The facility, which will be located in the heart of the 375-acre Fairgrounds, is scheduled to be open in time for the 2018 State Fair. 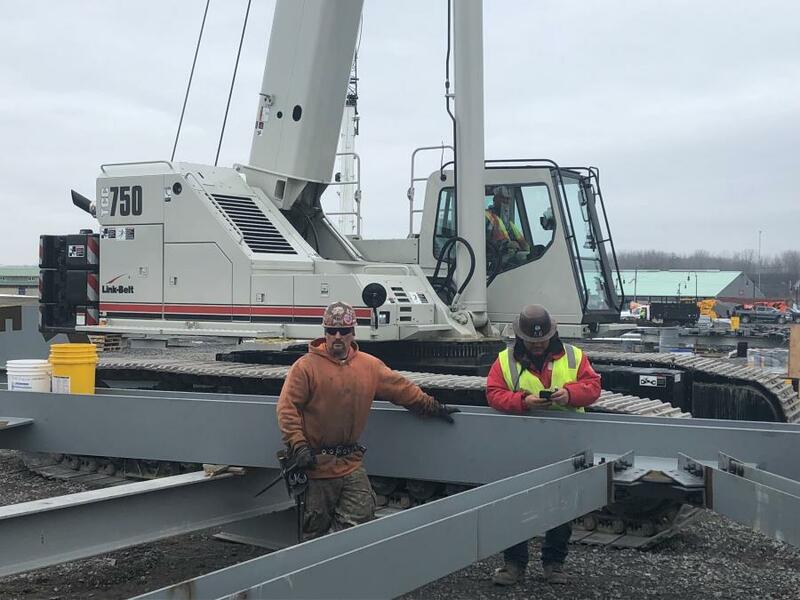 Christina Steel of Glenville, N.Y., is handling the steel erection on the project and currently has 30 employees on site. On this particular job, Christina Steel will be called upon to handle approximately one million ft. of steel. The trusses are 260-ft. long and 21-ft. deep, each weighing 60 tons. 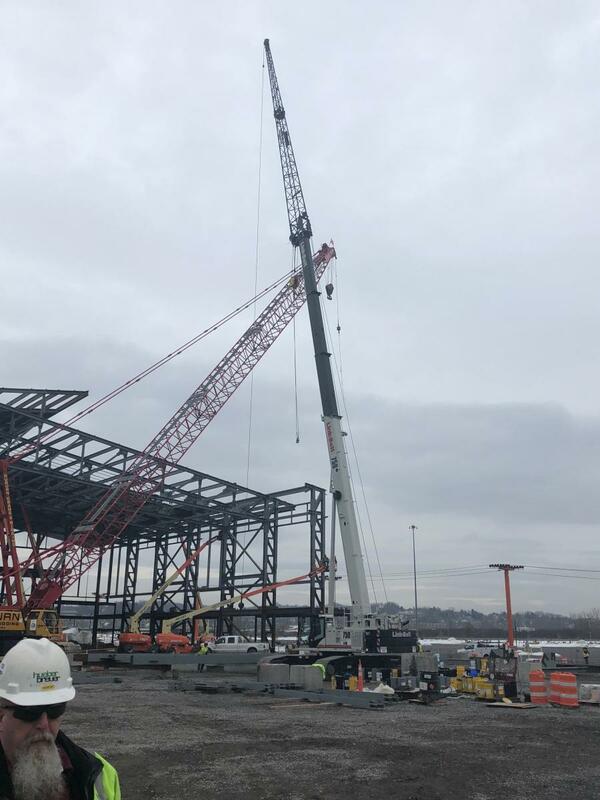 Because of their size, 14 of the trusses are being assembled on site, creating the need for several cranes to be used to position each piece of steel into position so that it can be bolted together before being placed into position. Due to an extraordinarily long winter and late spring, work on the project, which started Feb. 12, has had its share of challenges. With the continuous thawing and deep re-freezing the ground has been unstable and high winds and snow have shut down the project on several occasions. 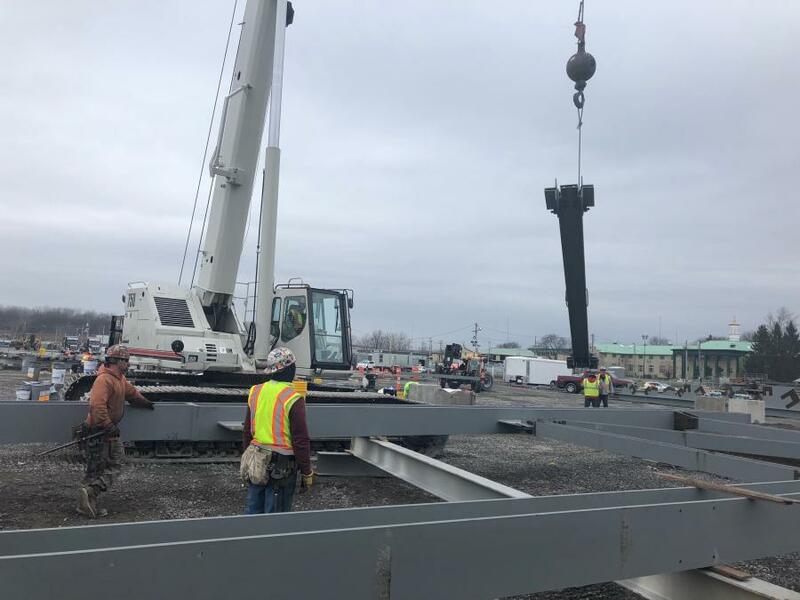 There are four cranes on site — a 300-ton crane, which Christina Steel has on rent, along with three Link-Belt cranes that originated from Woods CRW's Syracuse, N.Y., location. One of the three Link-Belt cranes is a RTC-8099 rough-terrain crane, which Christina Steel purchased from Woods CRW. The primary function of this crane on the job site has been to load and unload materials coming in and out. The cranes that are unique to this project are a pair of Link-Belt TCC-750 telescoping boom 75-ton crawler cranes with 115 ft. of boom and 58 ft. of jib. Equipped with the Link-Belt Pulse, the cranes have programmable features that each operator can customize to their display. Once operators have found the feel and capacities that they are looking for from the crane, the Pulse system allows them to move from one crane to another and immediately establish the same feel and setup. These two cranes are on rent from Woods CRW specifically to handle the assembly and tie-in of the 60-ton trusses. This would not be considered the typical application for this size and configuration of crane, however Woods CRW, which is Christina Steel's primary supplier of cranes, specifically recommended that for this particular job, the telescoping boom and the mobility of this size tracked machine would be ideal. 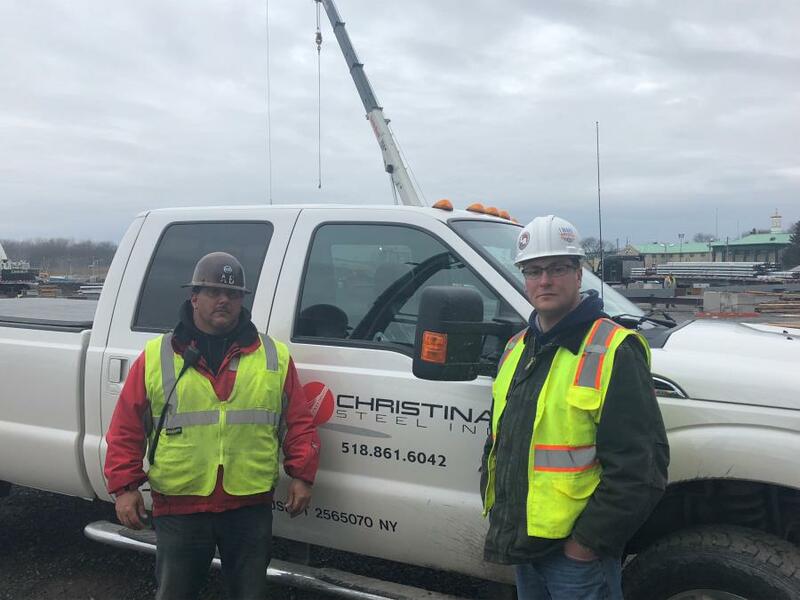 “These cranes have exceeded all my expectations, particularly their mobility on the site,” said George Audi, general manager of Christina Steel and husband of company president Christina Audi. 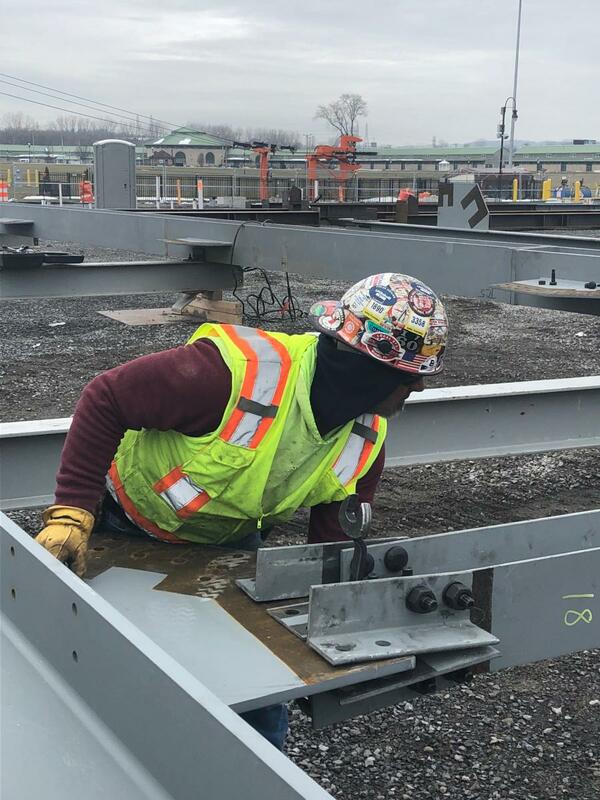 “They are very capable of picking up the pieces of these trusses and using a very small footprint to place them directly into the hands of our steel workers exactly where they need to be. Other crane systems would require outriggers which would substantially increase the footprint of the machine. The TCC-750s move at a speed of 2.5 mph and can be delivered on a job site in two loads. They can be operational in approximately an hour, according to the manufacturer. Woods CRW specializes in providing construction equipment solutions for companies and individuals in the northeastern United States. It has locations in Williston, Vt.; North Oxford, Mass. ; Central Square, N.Y.; and Carlisle, Pa.
Christina Steel was established in 2000 and is a New York State certified woman-owned business. Since its inception nearly 20 years ago it has been involved in some of the most challenging construction projects in upstate New York, including RPI Biotech facility, the G.E. Healthcare facility, the Empire State Plaza Corning Tower, the Capital Communications facility and the new Albany County Family Court, just to name a few. Christina Audi, president of Christina Steel, and her husband George, have a long history with the construction and steel erection industry. George's father, George Audi Sr., was the proprietor of Colonie Steel and Iron, which was founded in 1982. In fact, George comes from a third-generation of steel erectors. For more information on Christina Steel, visit christinasteel.com. For more information on Woods CRW, visit www.woodscrw.com. The New York State Agricultural Society was founded in 1832 and held its first state fair in Syracuse, N.Y., in 1841. Between 1842 and 1889, the fair traveled among 11 different cities (Albany, Auburn, Buffalo, Elmira, New York City, Poughkeepsie, Rochester, Saratoga Springs, Syracuse, Utica and Watertown), before The Syracuse Land Company donated a 100-acre tract of land in Geddes in 1889. Renamed the New York State Agricultural and Industrial Exposition in 1938, the fair was known as the New York State Exposition from 1962 to 1966, before being renamed the New York State Fair in 1967. The 375-acre fairgrounds complex operates year-round, and annually hosts approximately 300 non-fair events, ranging from major entertainment and sporting events to a variety of equestrian competitions, consumer shows and community events and meetings. It also hosts more than 40 horse events each year, including some of the most prestigious competitions in the Northeast. Cranes Link-Belt New York Wood's CRW Corp.